Lips in Glo Minerals "Aubergine"
This Winter, we are finally getting some cold temperatures in California and it's been raining frequently. I know our version of "Winter" is quite different than most of yours, but it's a welcomed change around here after five years of severe drought. I love driving around town and seeing green fields in place of tumbleweeds and dirt. Anyway, I recently stumbled across this shop on Instagram that drew me in with their selection of cozy knits, lace bralettes, and feminine styles. I don't even know how I found it, but I'm glad I did. I was still hesitant to order, but I'm really happy with this cardigan and now I want more! It's definitely over sized, but I prefer it that way. 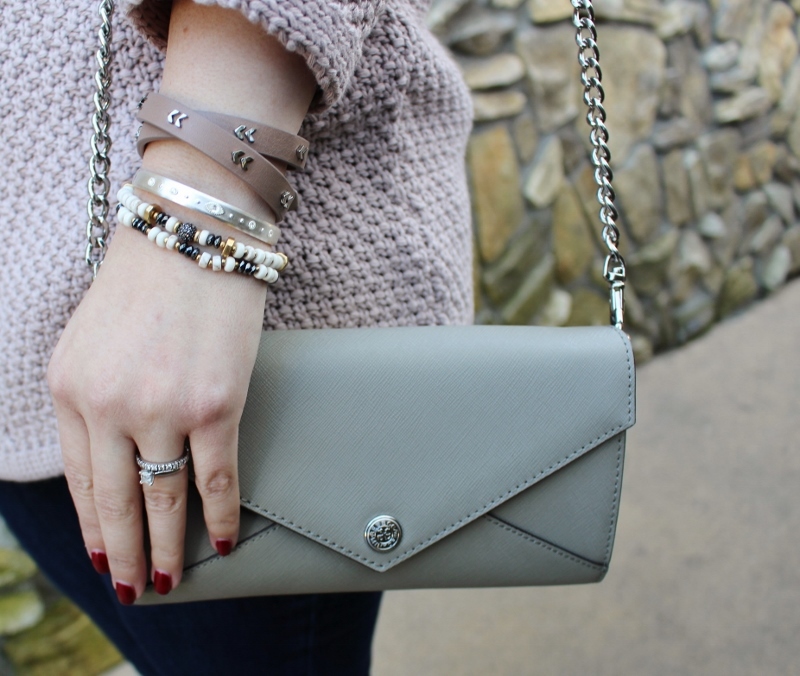 The taupe color and slouchy silhouette is perfect for wrapping myself in. It reminds me of a night spent curled up on the couch, hot tea (or wine) in hand, Nettie on my lap. I love those nights. All of my jewelry is Stella & Dot, and I'm mixing and matching new and old pieces. Sometimes, I just want to wear all the things! it's been cooler here as well and I love it. This outfit is so cute and I love that you paired the cozy knit with strappy sandals. Loving all of your pretty layered jewels! That cardigan is beautiful! I love the color! And your layered necklaces are so pretty! Love the cardigan! I'm generally more of an "everything must be fitted person" but something about this piece really speaks to me. And love the taupe colour too. Taupe is a great neutral for brunettes (I like camels and browns for blondes). Love this outfit! Feminine and cozy but also very pretty. LOVE all of your jewelry -especially that necklace! Just wanted to say you look beautiful in dark lip colors. You should wear them more! Aww thank you! I do love darker lips. I just have this bad habit of biting my lips a lot and so the color usually wears off. I will definitely take your advice though! Pastels look so great on you, Noelle!! 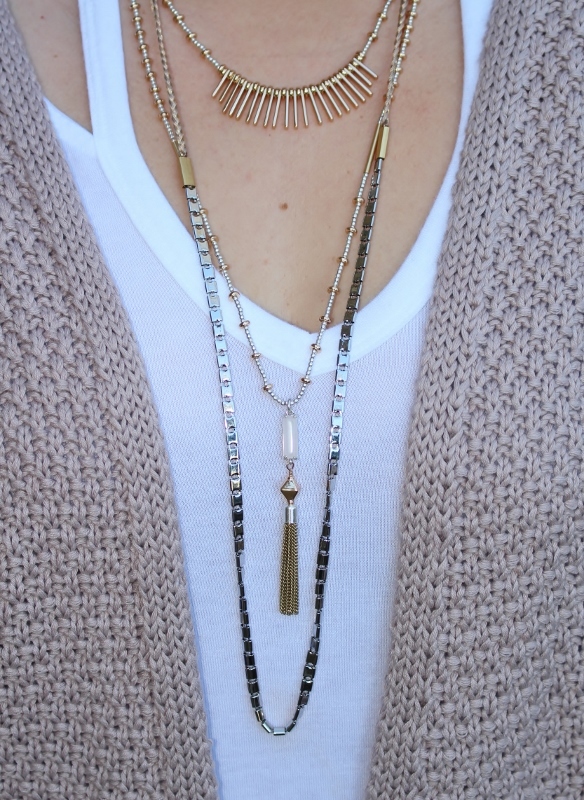 Curling up on the couch in cozy cardigan is one of the highlights of winter, and I'm all for layering up jewelry! I love that cardi! It's looks like a good weight and is a good color. You know I love neutrals!